Very balanced, nicely spicy, not too sweet and not too spicy. Not overly complex, but different ... no sherry bomb. I like it. 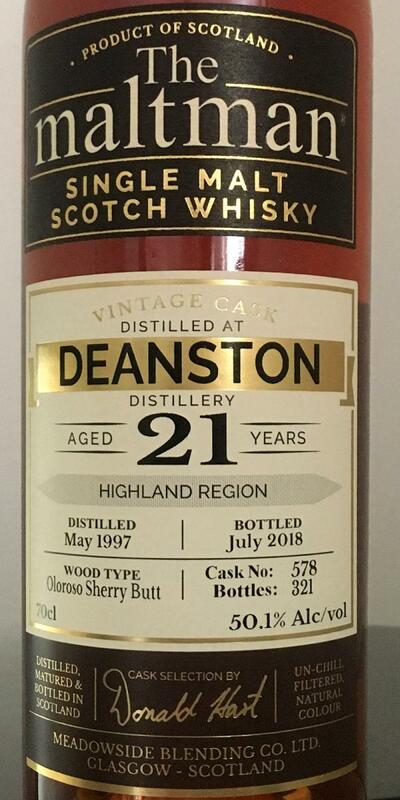 Good and well matured Deanston from the sherry barrel. Clear as Deanston. On the palate, I like this burnt caramel best. The nose is a bit simple. All in all a very neat-but also no toppaint. But you can safely knock out 120 thalers! Big-bodied, sweet and thick. Not a shy boy at all. Huh, not what I expected from color & cask type... A very nice, restrained, dark-roast maltiness initially, like root beer or barley candy. Mocha and powdered sugar. A bit closed-up at first, but then the typical Deanston sulphury-weighty-fermentary-diesel/coal fume note appears, alongside lovely forest fruits and wild honey. Consider me convinced. Chewy and thick, with dark honey, brambles, blackcurrant, and a tarry, oily, dark coal aspect. Leathery and tart, yet with a sweet backbone. 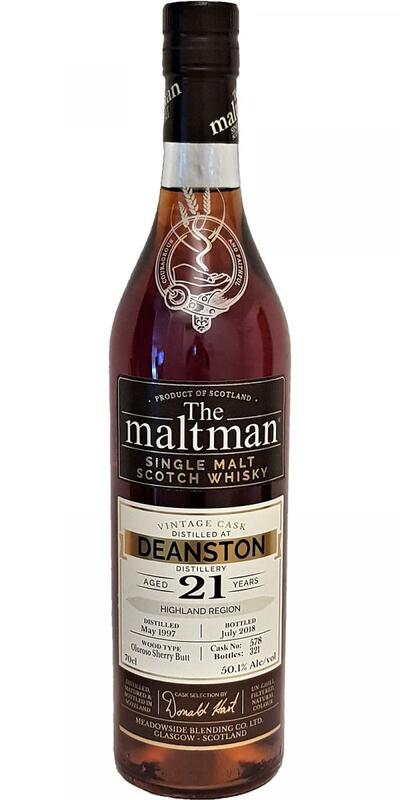 Very nice interplay between the dark, nutty Oloroso notes and the malty sweetness and spirit sulphur of the Deanston distillate. A winning combination. If I had to quibble: the sherry is perhaps a bit ... modern, and overt. But it all works a treat, even if it's not for those of us who cherish subtleness above all else. The palate on repeat: honey, fruits, leather, walnuts. It's not quite my favorite OA Deanstons, but quite decent and definite as Deanston and not killed by Sherry.